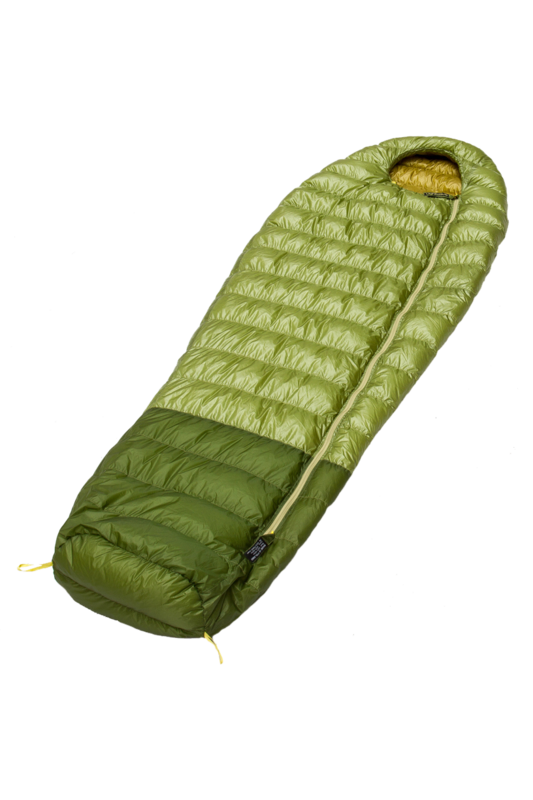 The Firelight 150 is a high quality, ultra-lightweight down sleeping bag that is ideal for use in temperatures down to 10°C. Please refer to the detailed information on temperature ratings below and click here for help on choosing a bag. Manufactured wholly in Poland, the Firelight 150 is filled with the famed Polish white Goose down that is 100% ethically recovered (read more here). The down has a fill-power of 900 cubic inches as measured by the EU norm (and is equivalent to 970 cubic inches using the US standard). The Firelight 150 has a full length zip that lies on the top of the bag. There is an adjustable drawcord in the hood, but no neck or zip baffle as these are not necessary for the temperature range it has been designed for. The Firelight 150 comes in two sizes and is supplied with a compact stuff sack and a large storage bag. 150 g of 900 FP down will fill the same volume as 170 g of 800 FP down or 190 g of 700 FP down. The construction describes how the down is held in place (otherwise all the down would fall to the bottom) and what features are incorporated to maximise heat retention or, conversely, regulate your temperature. A bag as light as the Firelight 150 does not need any additional baffles – such as for the neck and zip – as these features simply are not necessary for temperatures of ten degrees (above zero) or higher. The Firelight 150 is really a bag for those who are travelling extremely light and do not expect cold nights, or in instances such as mountain marathon races, are cutting weight as much as possible at the expense of weight. Another use is to boost the performance of a heavier bag by using it as a liner. Please click here for our end-use chart. have a comfortable night’s sleep. The Firelight 150 is available in two sizes. Both come with a left zip only.